When you’re scheduling social media posts for future delivery in a tool like Buffer, you may need to modify those posts at some point before they’re released. 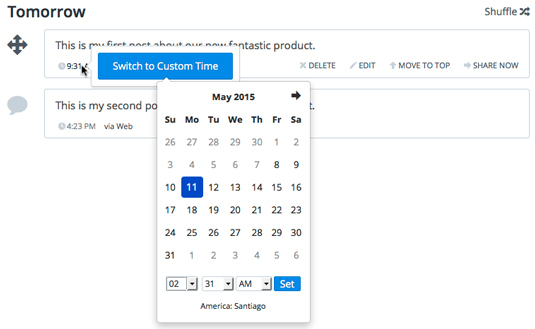 In Buffer, you can change the delivery date and time, edit the post’s content, or delete the post altogether. The sections below tell you how. Log in to Buffer and view your dashboard. On the left, click the social media channel that contains the post you want to change. You see the list of posts scheduled for delivery for that channel. Hover over the timestamp of the post you want to change. You see a Switch to Custom Time button appear. Click it. In the calendar that appears, choose a new date and time and then click Set. The post automatically changes delivery order based on the new date and time. Figure 1: Click Switch to Custom Time to bring up the date and time selector. If, at the time you created the post, you specified the post to be delivered to multiple channels, note that changing one instance of the post won’t change the others. If you want to change both instances, you have to do so manually. When you hover over a post, you see additional options for modifying the post (refer to Figure 1). Delete: Obviously, this nukes the post. Edit: This option calls up the editing dialogue box, in which you can change the text of your post (see Figure 2). If you click the camera icon, you can also add an image to the post. Move to top: Clicking this option moves the post in question to the top of the list. It also automatically changes the delivery order. Share now: This option delivers the post immediately, rather than at its scheduled time. Figure 2: Editing your post in Buffer.